My friend, Chellie, introduced me to this drink last summer and I have been a dedicated maker and drinker of this beverage ever since. For me it has become the drink for summer gatherings with friends. 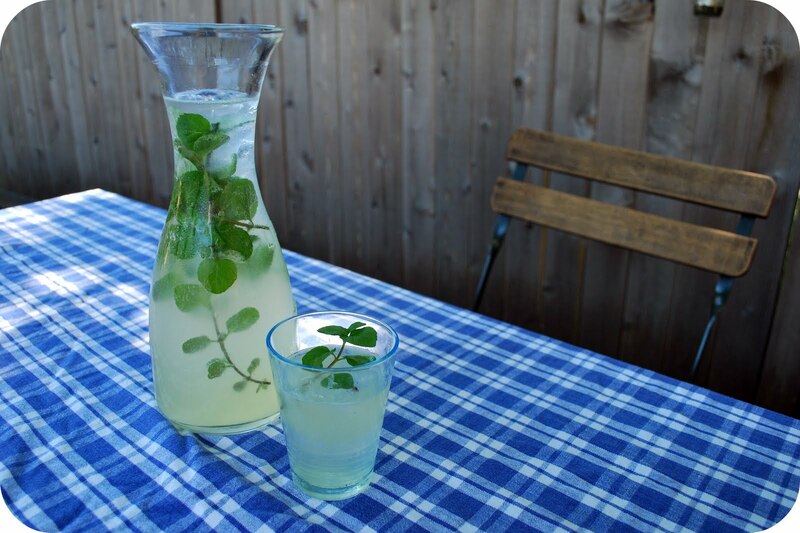 Served over a glass of ice with an extra sprig of mint, it is the perfect refreshment for the backyard, the cabin, the deck, a picnic, or wherever you can manage to hold one in your hand without spilling it (which may become a challenge if you drink too many in one evening). Chellie made this originally with a can of frozen lemonade--and while I do offer that version of the recipe as a variation in my download for those who want the quick and dirty method, the recipe on the card tells you how to make these from scratch--meaning, you make your own lemonade with freshly squeezed lemons (not that you make your own vanilla vodka though--I'm not freakin' Martha over here--vanilla Stolis works fine where I come from). Just take care not to drink too many--it is easy to do. Um, speaking from experience (like last weekend's experience at a friend's when I returned with a splitting sugar and alcohol headache after downing these all afternoon). You know, drink in moderation is all I am saying--for your own good. i am always in need of a good, refreshing summer cocktail - this might be it! i posted awhile ago about my easy box wine sangria, i am eager to try this. thanks! If you blend the mint or smash and remove, you can make adult ice pops. You could even make half the batch pink lemonade and freeze the pops in a couple stripes. Here in Israel we always put mint in the lemonade, or blend it into a lemonade slushy, and it's always fresh lemons and mint. In Hebrew mint is Nana, so it's called Lemonana (w/o mint is Lemonada).